According to local sources, US-led coalition forces have begun setting up a new military base in Tabqah town in the province of Raqqah. The new base will be located in the military housing area, the Mohammed Fares school as well as the military and security buildings in the third district of the town. US forces reportedly intend to build a command center and residential buildings for its troops. 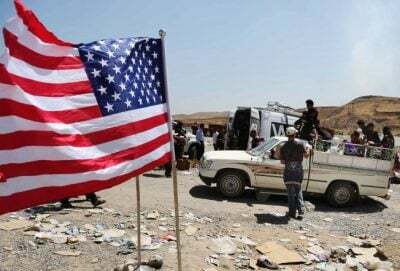 According to opposition sources, USA wants to adopt the new base in Tabqah town as a long-term base in Syria. Meanwhile, unconfirmed reports from Kurdish sources appeared arguing that a new agreement between the USA and YPG was made. The agreement will allegedly allow the US military to stay in the YPG-held areas for 10 years. In turn, the US will continue providing military aid to YPG. However, no official sources have reported about this. The Turkish News Agency Anadolu announced that Washington has supplied YPG and YPJ Kurdish forces in Syria with modern weapons within the last ten days. On June 16 , 50 trucks loaded with weapons arrived through Kurdistan Region border crossings. On June 5, 60 trucks loaded with arms arrived to the SDF-held areas. 20 more trucks arrived on June 12, according to the agency. According to the Anadolu report, the Kurds received: 12,000 rifles, 6,000 machine guns, 3,500 machine guns, 3,000 RPG-7 bombers and 1,000 grenade launchers of the AT-4 type produced by the United States and LNG grenades, besides near 235 mortar rounds, 100 sniper rifles and 450 7PV night vision sights.